There is a bingo site after the hearts of the Canadian players and pampers them with the finest bingo experience on the Internet. Canadian Dollar Bingo invites all players to experience a taste of Canada and mingle in their bingo rooms. Players who have not visited Canadian Dollar Bingo for a while will be in for a pleasant surprise. They have completely revamped their homepage and the design is a marvelous change. I have to admit I never cared much for the homepage with what I considered an annoying man speaking about the site. It gave me a strong compulsion to immediately click off! It is amazing what a new web design will do to a site. It changes the entire perspective and I must admit I am impressed. The squirrel advert is down right huggable and the red hues make for a very elegant appearance. Two thumbs up Canadian Dollar Bingo for a job well done. Players will be asked “Why Play here?” with a list of good reasons why. After viewing what all there is to offer you may be asking yourself “why wouldn’t I play here”. They have been around for over 8 years and that type of status gives them reputation for good bingo business. Canadian Dollar Bingo is one of many under the umbrella of Amigo Bingo and gives them a strong foundation for a premier online bingo portal. They are not secluded to Canadian players and reach out to a global market including US players. 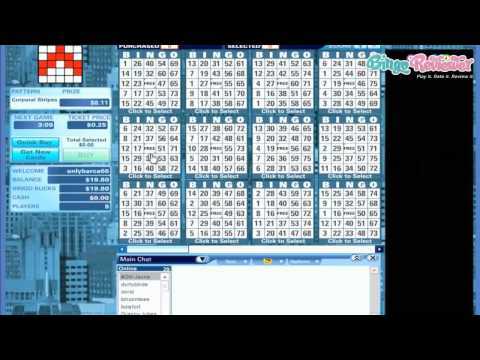 Players will never be bored playing 75 ball bingo with 100’s of patterns to bingo on. The chat moderator plays fun interactive games and rewarding the winner with Bingo Bucks. The caller is clear with a pleasant voice and calls numbers at a nice pace. The chat box features colored text, smileys and an option to announce every time a new player enters the room. Add more fun to your bingo game by playing the side games with a wide variety of games to choose from. There are two software for Slots, Parlay and Betsoft. The Betsoft slots can only be played after a deposit is made while the Parlay slots can be played with any winnings from Bingo Bucks that have been converted to real cash. If you have a yearning for poker, Video Poker is the perfect game with several variations available. Other games include Keno and Pull Tabs. All these games are powered by Parlay and Betsoft software as well with the exception of Keno which is exclusively a Parlay game. Unlike most other bingo sites that offer an attractive welcome bonus on your first deposit, Canadian Dollar Bingo offers it on all deposits. The mega bonus allows longer playing time and an enormous bankroll. New players are still welcomed with free bingo bucks to try out the bingo rooms. Though bingo bucks limit players to only bingo, any prizes won will transfer to your cash balance and allow any games to be played. The Benefit Program will accrue any fees that were charged by the processor and credit your account. Simply fill out a support ticket and the refund will be on its way. A Cash Return Bonus will give a percentage back of all deposits made the month before with the exception of any cash payouts. Daily and Monthly Specials can be found under the Promotions page. The new web design has greatly enhanced the look and feel of the site. Having two software doubles the playing pleasure. We rate Canadian Dollar Bingo with 4 Pink Hearts. They have some of the best varieties and offers for bingo that I’ve come across! My favorite is definitely the fair and square bingo because it gives every player an equal opportunity to win. Everyone is friendly on there and they don’t make you feel uncomfortable if you’re not a resident of Canada even though the site was created primarily for those members. They accept a variety of other players and it’s a nice mix. They’ve got a few different bingo rooms to choose from, but I mostly stick to the 25c PJP room because, in my opinion, I feel it has the best jackpots. For whatever the reason, it seems to have the best atmosphere of the bingo rooms as well. It’s laid back and people have fun and chat and small talk. Another thing I like about them is that they offer 3D Slots which not a lot of sites do, and those combined with their bingo make it one great site! Hurray for US friendly sites and hurray for Canadian Dollar Bingo where the international crowd can all feel right at home. I like this site. It's got a lot of different bingo games and I, too, enjoy the fair and square room here for an equal-opportunity chance to win. I also love to play the Parlay slots and I've gotten pretty fond of the 3D slots as well, as long as I have a nice balance to start with I usually can keep playing for days. You have to play the slots with your cash money, but any bonus money you have where you win your bingo game, you can use those winnings as they are in your balance now as cash. So be sure to try out any slots you haven't played here so you know what you were missing. This site has lots of sisters (Amigo sites) so be sure that if you have multiple accounts you know all the rules for deposits and withdrawals and winning. You don't want to be caught unaware of any stipulations that would put a kink in your cashout! A nice friendly site I don't hesitate to recommend for your bingo enjoyment. Happy playing and good luck! This is a great site and their homepage is loaded with glimpses of all the great things they have to offer! They have a really nice selection of bingo. You won’t know where to start with all the goodies they have to offer. They have a great version of fair and square bingo which you don’t see just anywhere. On top of this, they have coverall games and fantastic progressive bingo jackpots. They have exciting chat games that allow you to win even more prizes. The only downside is that chat games are only offered in one room: the city bingo room. In total, they also have only three bingo rooms which seems to be on the low side. I would prefer to see more. However, when it comes to their other games, they have a great selection as well. Overall, I was impressed by this site, and it is not just for Canadian players! First of all, I wanted to try this site only for this great starting No Deposit Bonus, and with a $20 starting cash just to sign up, it's the offer hard to resist. Well, I loved the site after all, and even though they only have the 75 ball games, which is a bit weird. Most of the casinos have at least 75 and 90 ball games, and I miss the other variants since I love to have a good choice of bingo. It's a shame that they don't have more of it. Well they do have some Slots, Keno and Video Poker, and that is just enough for most of the people. I have noticed that Canadian sites are usually really good, and this one is no different. I contacted the support for a few times, and they were great, I had nice chat, with all my questions answered immediately.